The first Norton with a rotary engine to go into limited production was the air-cooled Classic. A batch of 100 were built in 1987 and despite a high price (£ 6,000) all were sold within a few weeks of the announcement that they were to be released to the public. These were the first Nortons of any type to be sold since the collapse of the old Norton-Villiers-Triumph conglomerate some ten years earlier and the enthusiastic British biking public were only too ready to support this new venture. Unfortunately, despite the many years of development there were problems – mainly with the cooling. The obvious way to cure this was to abandon air-cooling and to switch to water – which would have the added benefit of making the engines quieter. Consequently Norton boss at the time Phillipe Le Roux, a South African born financier, ordered the director of engineering, David Garside, to press ahead with the development of a new water-cooled engine. The prototype models were tested by the British police. Using the machines virtually 24 hours a day enormous mileages were covered in the space of a few weeks – with the police reporting back directly to the factory. Unlike the Classis the new bike, named the Commander, was designed with an integral enclosure with included a fairing, windscreen and panniers. For it was to be a BMW-style ‘super tourer’ rather and a stark, sports bike. 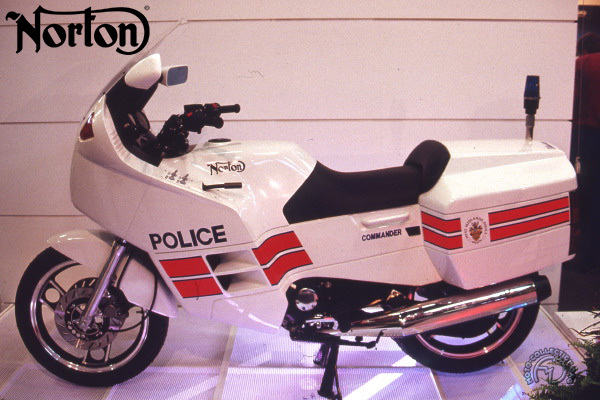 The civilian version of the Commander was first shown in London in May 1988 but did not go on sale until 1990. Since then it has been in limited production but has not proved a ‘best seller’. Built as a super tourer, the Norton Commander is powered by a water-cooled twin rotor Wankel engine. Here is the Police version fitted with radio equipment.